Annet Gelink Gallery proudly presents Carla Klein’s (1970) fifth solo show at the gallery. Klein returns to Annet Gelink Gallery with a series of striking new paintings that display a new vision and direction for the Rotterdam-based artist. 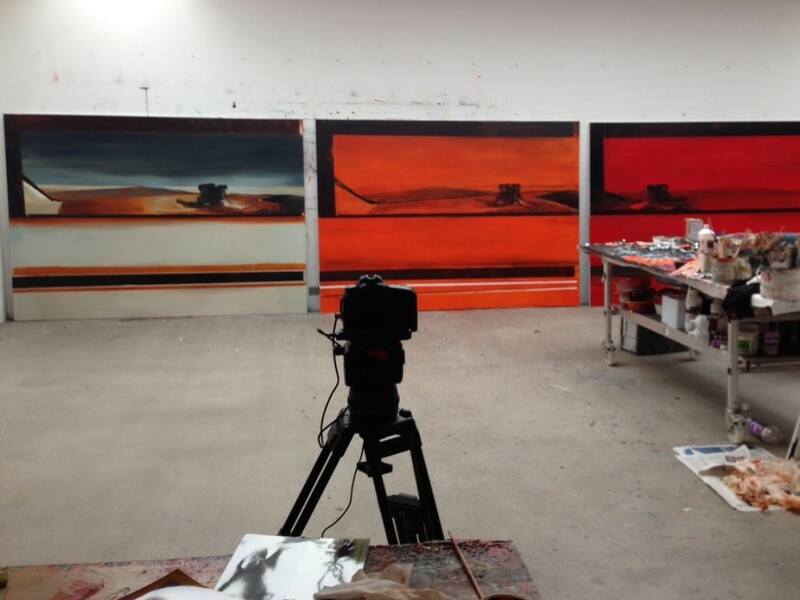 Exchanging her palette of muted tones of greys and blues, with the occasional dash of bright colour, Klein here presents a series of four large scale landscapes in a vivid array of red and orange hues. Throughout her oeuvre Klein explores the relationship between reality and representation. Working from photographs taken and developed by herself, Klein creates paintings that depict abstracted landscapes and deserted, impersonal architectural spaces. Through painting, she approaches her experience of the captured image, even including ‘mistakes‘ formed during the development process. As such the paintings question how we hold on to our view of the world surrounding us, when this process is mediated by equipment such as cameras. This question seems all the more relevant in light of the rise of social media that have popularized the sharing and taking of photographs. These streams of photographs present a vision of the world that is often heavily edited through digital colour filters. Referencing these filters, Klein layers colour over her photographed visions. These distortions, often the result of chance occurrences in the development process of the photographs, make for compelling landscapes that seem both alien and familiar. Through the recurring motives in the paintings presented, Klein also highlights how our attachment to photographs has been altered with the constant influx of images through various media. With the presented works, Klein forces us to contemplate each single developed photograph and photographed landscape. Confronted with the imposing paintings, we search for the differences and similarities in the details of each. In painting, Klein subtly addresses how photography influences our understanding of authentic experience. In the Bakery Annet Gelink Gallery is pleased to present the recently premiered documentary on Carla Klein, which is part of the series Hollandse Meesters in de 21e eeuw (Dutch Masters in the 21st Century). This series of short portraits focuses on Dutch contemporary artists, and follows them at work in their studio. The intimate portrait made of Klein, made by director Marc Schmidt, shows her working on the paintings displayed and reveals the process through which the final works appear on canvas. Carla Klein studied at the Koninklijke Akademie voor Kunsten, The Hague and the Rijksakademie, Amsterdam. Recent solo and group exhibitions include Contemporary Art Museum St. Louis (2014), Tanya Bonakdar Gallery, New York (2014 and 2009), The Granary, Sharon (2013), TENT, Rotterdam (2012), Kunsthal. Rotterdam (2011), World Class Boxing, Miami (2008).